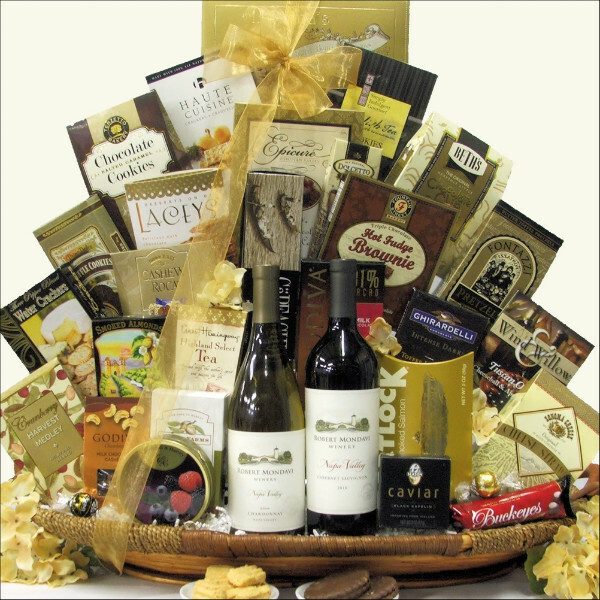 This elegant gift basket is sure to bring a smile to their face upon opening. The Robert Mondavi Napa Valley Series Duet Wine gift basket contains a wonderful assortment of gourmet foods and two premium Robert Mondavi wines that they will savor, including Robert Mondavi Napa Valley Chardonnay White Wine and Robert Mondavi Napa Valley Cabernet Sauvignon Red Wine. In addition to the wine, this basket features additional upscale gift food items including Portlock Smoked Salmon, Capelin Caviar, Clair de Lune Brie Creamy Cheese Spread, Three Pepper Blend Water Crackers, Snacks, Tea, Chocolate, Cookies and more.